Got one decent cut, a comment on the coming Bradford Bulls v Salford Reds Rugby Superleague clash: "I hope everyone has a good time on Sunday, but I hope the red team wins next Thursday". It did. There was euphoria (for a bit). Then there wasn't. 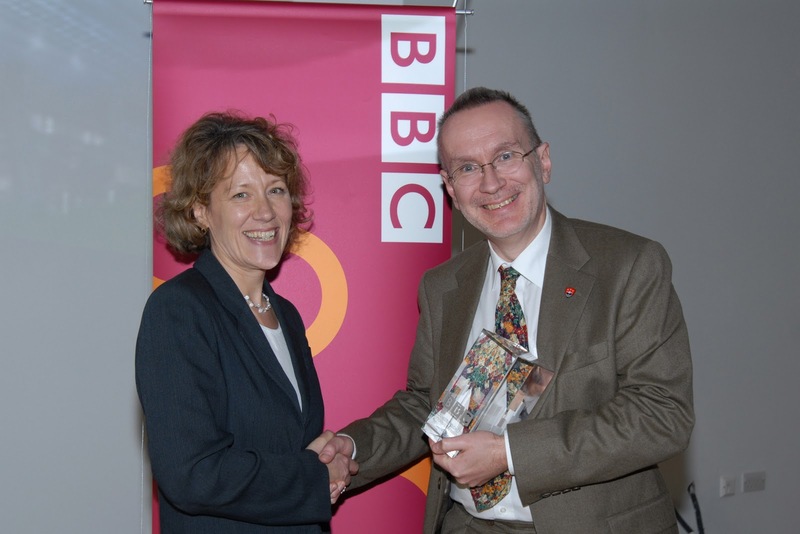 Collected it from BBC Academy Partner Liz Molyneux on behalf of Leeds Trinity postgraduate trainee (now Look North reporter) Emma Blackburn, February 2009. Liz warned me it was heavy. My arm's dropping off. Postgrads Gail Champion (now with File on Four) and Matt Game (now working outside journalism) with newsreader Huw Edwards at a BBC reception early in 2005. Matt was one of the first on the scene of the bus blast in Russell Square later that year. The scheme itself became a casualty .. of BBC cutbacks. 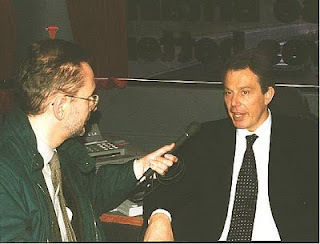 On 14 July 2005 every news organisation wanted to broadcast live from Leeds as police made a series of raids in connection with the 7/7 terror attacks in London. 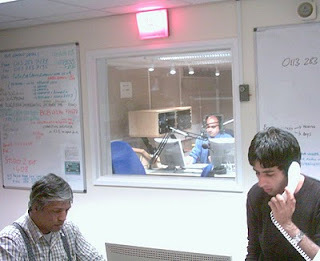 With no space at the BBC North building, the Asian Network had to find another base for its operations. 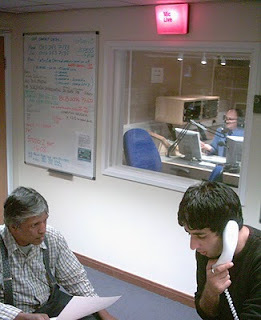 As a result South Asia (India, Pakistan, Bengaladesh and Sri Lanka) found out about the Leeds link to the London bombings from the postgraduate studios at Leeds Trinity. Are You Ready ... for the Real Radio Experience? There were also a series of evening 'masterclasses' for FE media students at Real's swanky Leeds headquarters . 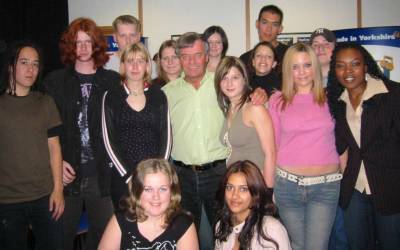 The first of these was launched by wireless legend Tony Blackburn (below) who told the students he'd not had more than four hours' sleep a night for forty years. And he certainly looked like he was telling the truth. 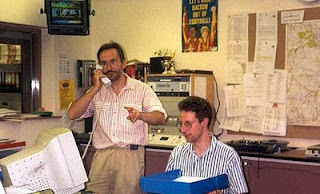 Richard in the newsroom at The Pulse, very proud of his pager in 1995. I liked that shirt. 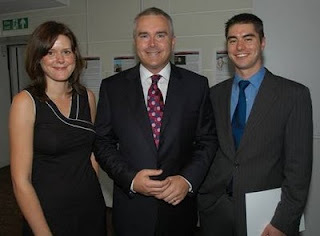 With me in the picture Nik Walshe, a Leeds Trinity graduate who went on the become news editor at Galaxy 106.6 FM before fleeing the country. He's now enjoying the good life in Canada where he's not a lumberjack but he's certainly OK with his wife and lovely daughter. I love this picture (Thanks guys at the Bradford Telegraph and Argus). 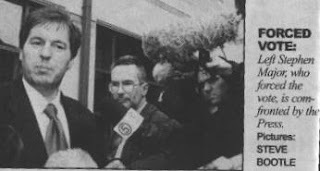 Leading the pack to comfront (sic) the guy who won the vote to force the privatisation of the Bradford & Bingley Building Society against the wishes of the board.